Adjustable field ball cart, aluminum frame. 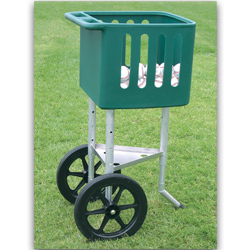 Aluminum frame with heavy duty molded plastic hopper & large rear wheels for easy mobility. Legs are height adjustable to raise or lower hopper height. Holds 200 baseballs/100 softballs Wt 24 lbs. NOTE: This popular item delivers in approx. 2 weeks. Please keep this in mind when placing your order.